Ironman 70.3 Philippines will be hosted by Cebu this August 5, 2012. The race route is quite extensive covering from the tip of Mactan Island, crossing the Marcelo Fernan Bridge, to Mandaue City via CICC and Parkmall leading to SRP and back. 1. 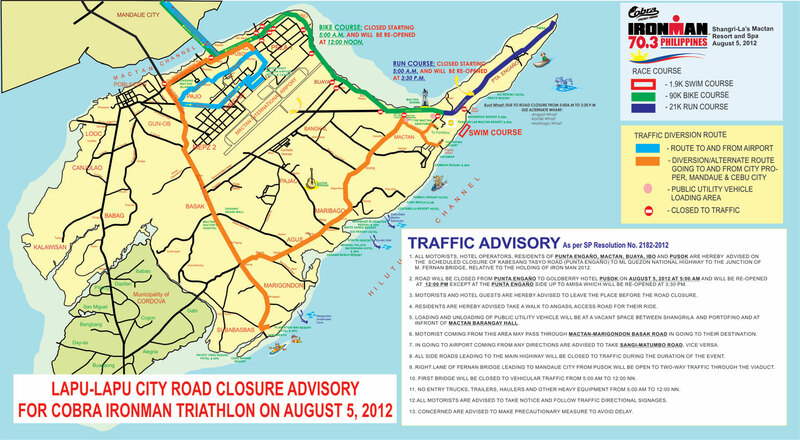 The race route will be closed starting at 5 in the morning. 2. Right lane of the Marcelo Fernan (new) Bridge will be open to two way traffic while the old bridge will be closed from 5am to 12nn. 3. The run route (in dark blue) from Shangrila Mactan upto the tip of Punta Engano will be closed from 5 am to 330pm. Once the route is close, Shangri-la is only accessible through Portofino. 4. The bike route (in green) from Shangrila Mactan through Marcelo Fernan Bridge to Mandaue Highway, to Ouano Avenue passing through CICC and Parkmall leading to SRP will be closed from 5am to 12nn. 5. Alternate route to and from the airport is specified above in light blue. 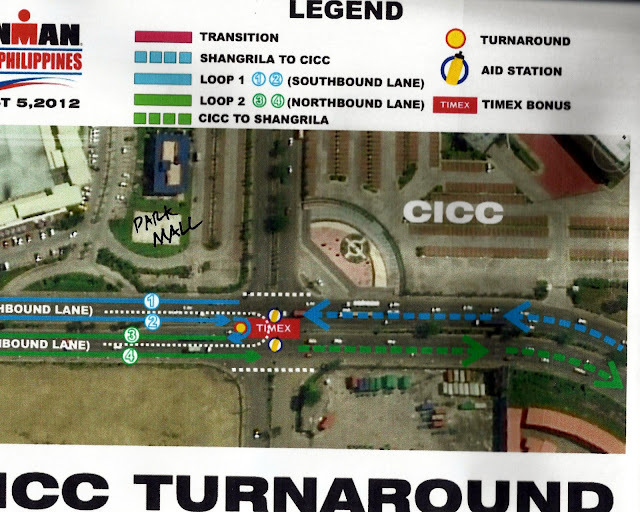 If you're not keen on taking chances of getting stuck with traffic around Mactan, next best spot to watch the race should be where the bikes are expected to slow down and pass twice is at the CICC turnaround point (at the intersection of CICC and Parkmall along Ouano Avenue). Strong swimmers are expected to start their bike by 7am and end up in this junction fifteen to thirty minutes later. All registered Ironman and Ironkids athletes will be issued one (1) set of complimentary companion wristband. All wristbands are color coded daily and are valid only on the day specified. *Please ensure your companion wears the proper color wristband per day. As your and our guest safety and security is our primary concern, we are limiting the number of non in–house quest who may access the resort during this period. We are implementing a number of security measures which include the limited sale and issuance of wristbands (color–coded per day). Who can buy the wristband? Registered Ironman and Ironkids athletes who want to bring in more than one companion to the resort. Non in–house Ironman and Ironkids participants. To allow equal opportunity for all, a maximum of two (2) wristbands may be sold per person until August 4, 20:00nn. Remaining wristbands after this time may already be sold to anyone, without limitation on quantity. What benefits do we enjoy with the purchase of a wristband? Access to all Ironman-related venues within the resort. Savings of 35% on regular treatments at CHI, The Spa at Shangri–La. Children 11 years old and below will enjoy 50% savings. All wristbands are color coded daily and we are valid only on the day specified. A limited number of wristbands will be sold daily on a first come, first served basis. Parking of vehicles inside the Resort will not be allowed from August 2–5 as parking areas will be utilized for the bicycle and run transition. 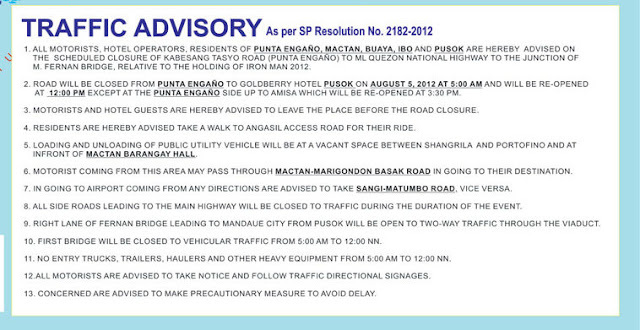 The Resort and Ironman organizers have identified temporary parking areas nearby for this period. Only car drop-offs will be allowed from August 2–4 while strictly "no vehicle access" policy will be implemented on Sunday, August 5. The Resort main entrance will be accessible by foot for athletes and guests with proper wristbands on Sunday, August 5 until 5:00am only. Once the roads are closed, access to the Resort will be through Portofino.